Hey, what's up with those environmental overlaps in the ENMTools R package? I'm so glad I asked! The env.overlap metrics produced by the ENMTools R package are based on methods developed by John Baumgartner and myself. The purpose of these metrics is to address one of the key issues with the niche overlap metrics currently implemented in ENMTools and elsewhere; the difference between the geographic distribution of suitability and the distribution of suitability in environment space. 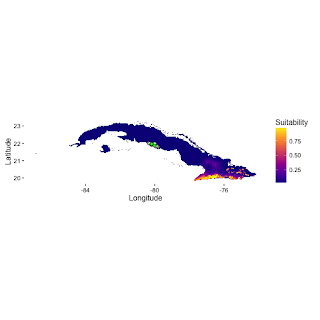 Existing methods in ENMTools and most other packages measure similarity between models via some metric that quantifies the similarity in predicted suitability of habitat in geographic space. While this may be exactly the sort of thing you'd like to measure if you're wondering about the potential for species to occupy the same habitat in an existing landscape, it can be somewhat misleading if the availability of habitat types on the landscape is strongly biased. For instance, what if two species have very little niche overlap in environment space, but that overlap happens to occur in a combination of environments that turns out to be very common in the current landscape? So they're pretty different, right? But what if the only available environments in the study region occur in that area of overlap? E.g., what if the current environment space is represented by the green area here? Well then the only environments we have within which we can measure similarity between species happen to be those environments that are suitable for both! This means that our measure of overlap between models in geographic space could be arbitrarily disconnected from the actual similarity between those models in environment space. Depending on the sort of question we're trying to ask, that could be quite misleading. 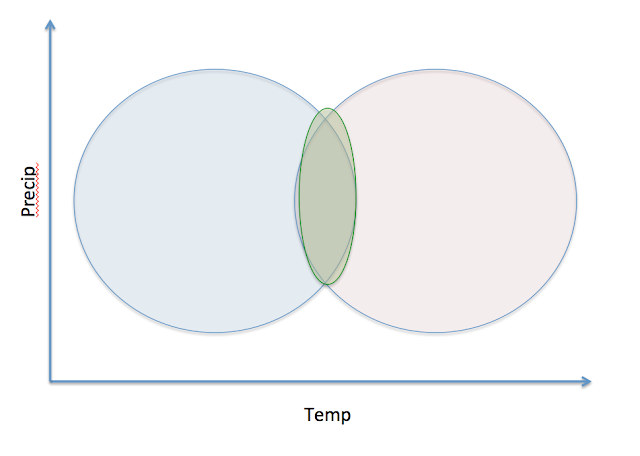 The method of measuring overlap developed by Broennimann et al. (2012) deals with this issue to some extent. However, those methods only work in two dimensions, and only work by using a kernel density approach based on occurrence points in environment space. My guess is that that's still way better than what the original ENMTools approach did for most purposes, but it's not very useful if (for instance) you want to ask how similar the environmental predictions of a GLM are to, say, an RF model. You simply can't do it. Or if you want to ask questions in a higher dimensional space, you're basically out of luck. So what can we do? 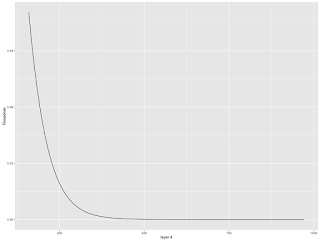 Can we figure out a way to measure overlap between two arbitrary models in a n-dimensional space? It turns out that this is not easy to do exactly, but you can get approximate measures to an arbitrary level of precision fairly easily! Our approach leverages the fact that R already has great packages for doing Latin hypercube sampling. This allows us to draw random, but largely independent, points from that n-dimensional environment space. 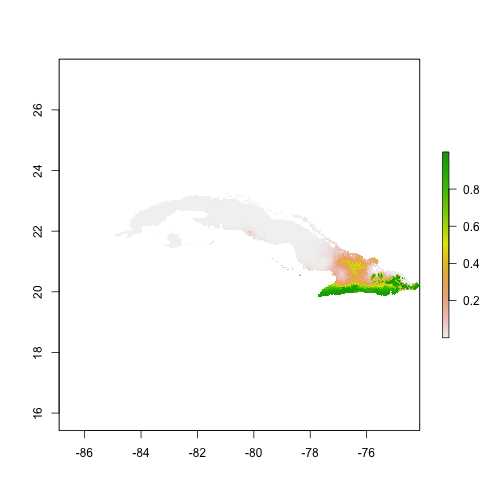 We can then use dismo's predict function to project our models to those points in environment space, and measure suitability differences between species. Obviously throwing just a couple of points into a 19-dimensional space (for instance, if you're using all Bioclim variables) isn't going to get you very close to the truth, but of course if you keep throwing more points in there you will get closer and closer to the true average similarity between models across the space. SO that's what the method does: it starts by making a random Latin hypercube sample of 10,000 points from the space of all combinations of environments, with each variable bound by it's maximum and minimum in the current environment space. Then it chucks another 10,000 points in there, and it asks how different the answer with 20,000 points is compared to the answer with 10,000. Then repeat for 30,000 vs. 20,000, and so on, until subsequent measures fall below some threshold tolerance level. 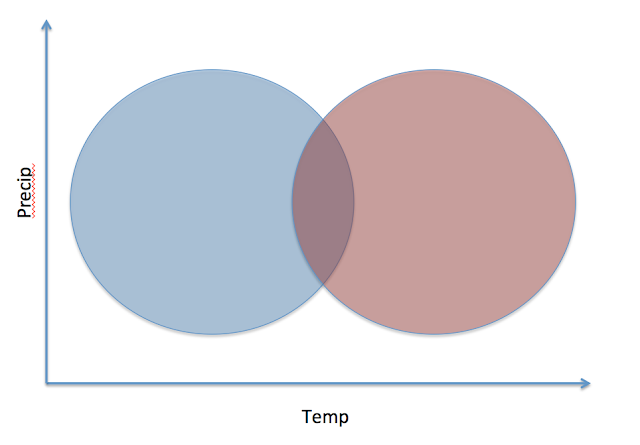 This allows us to get arbitrarily close to the true overlap by specifying our tolerance level. Lower tolerances take longer and longer to process, since it requires more samples for the value to converge. 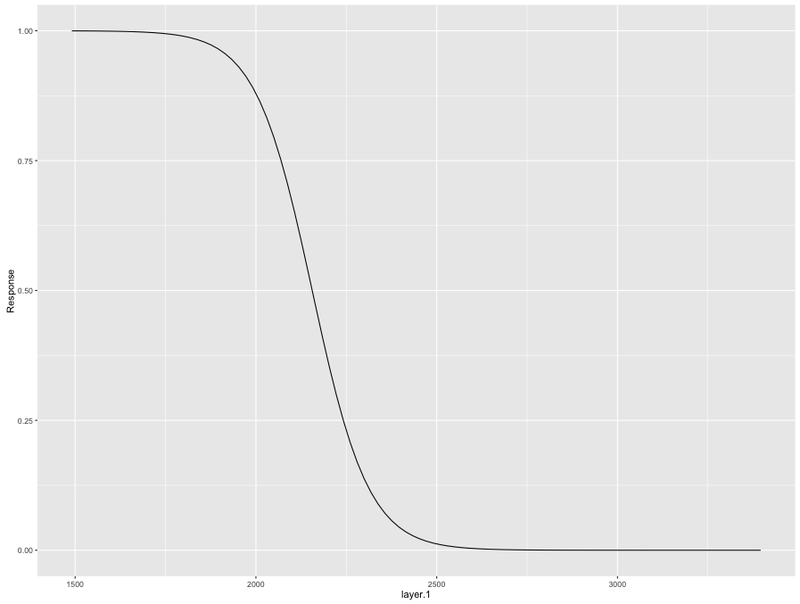 However, we've found that with tolerances set at around .001 we get very consistent results for a 4-dimensional comparison with an execution time of around two seconds. Pretty cool, huh? 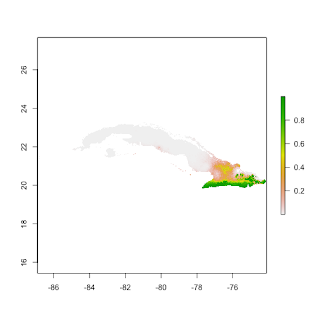 Now you can compare the environmental predictions of any two models that can be projected using ENMTools' predict() function in environment space, instead of just looking at their projections into a given geographic space! 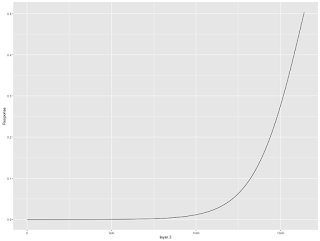 However the switch to ggplot2 allows for a lot more flexibility down the line, and also makes it easier to store plots as objects for future manipulation. This has a number of advantages. 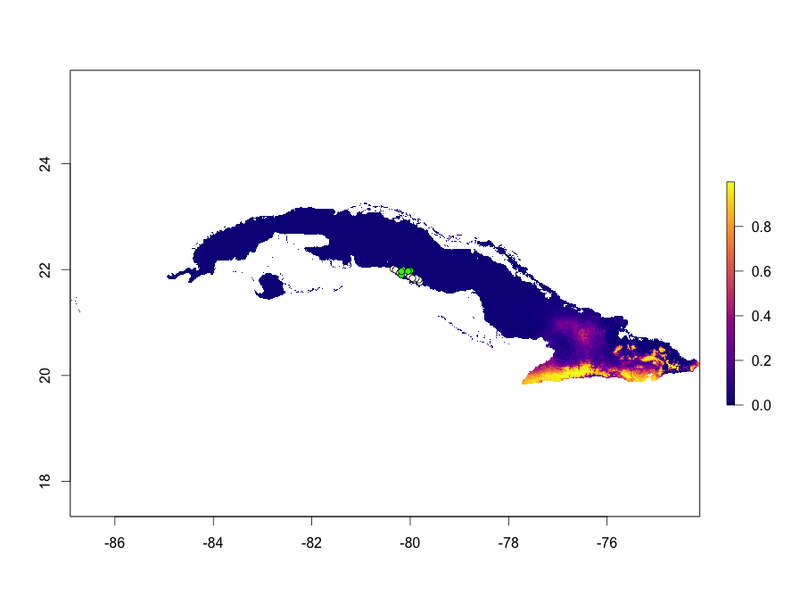 First, viridis color ramps are very pretty, and this particular one has a very familiar Maxent-y sort of look about it which makes it easy for an experienced SDM modeler to interpret. More importantly, the viridis color ramps are designed with accessibility in mind. The authors put a ton of work into figuring out a set of color ramps that are interpretable when printed in greyscale AND accessible to people with varying types of color blindness. That's pretty awesome. And they will automatically withhold that proportion of your data for model testing. Now when you call your model object, you get training and test evaluation metrics! layer.1 -0.012770 0.007165 -1.782 0.0747 . 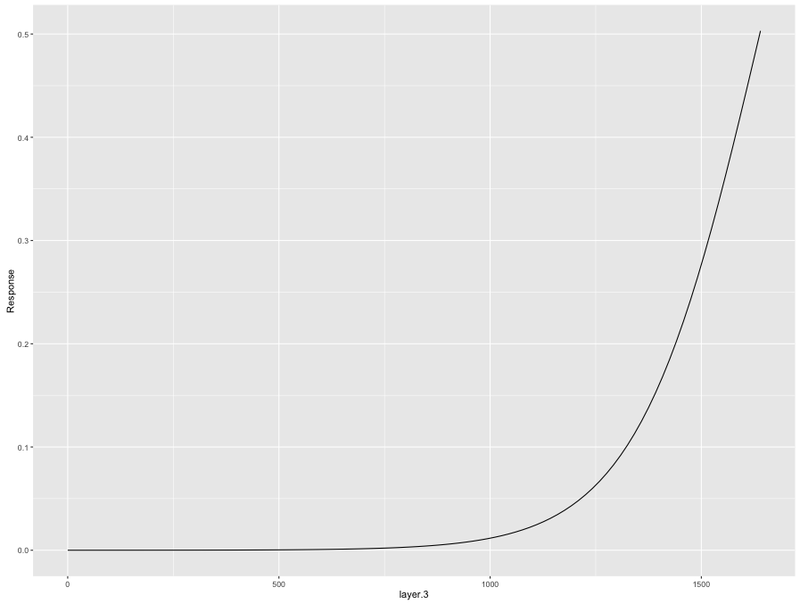 I may do some more tweaking in the future, but these are ggplot2 plots so you can easily modify them however you want. What is "symmetric" vs. "asymmetric"? 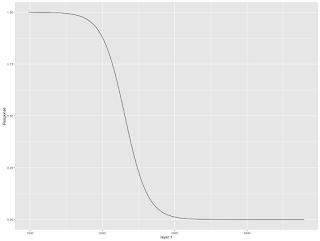 Well, an asymmetric test means that we are comparing the empirical overlap to a null distribution generated by comparing one species' real occurrences to the background of another (species.1 vs. background of species.2). In the Warren et al. 2008 paper we used this sort of asymmetric test, repeating it in each direction (species.1 vs. background of species.2 and species.2 vs. background of species.1). While we had the idea that that might generate some interesting biological insight, I think it's generated just as much (if not more) confusion. 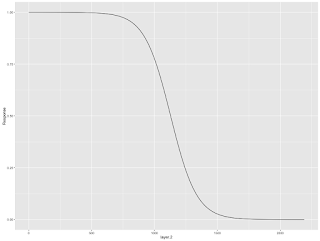 For this reason, the new R package also provides the option to do symmetric tests. These tests compare the empirical overlap to the overlap expected when points are drawn randomly from the background of both species (species.1 background vs. species.2 background), keeping sample sizes for each species constant, of course. Okay, let's say we've got two enmtools.species objects: ahli and allogus. How can we run an identity test? So here's how we'd run an identity test using GLM for our two species. 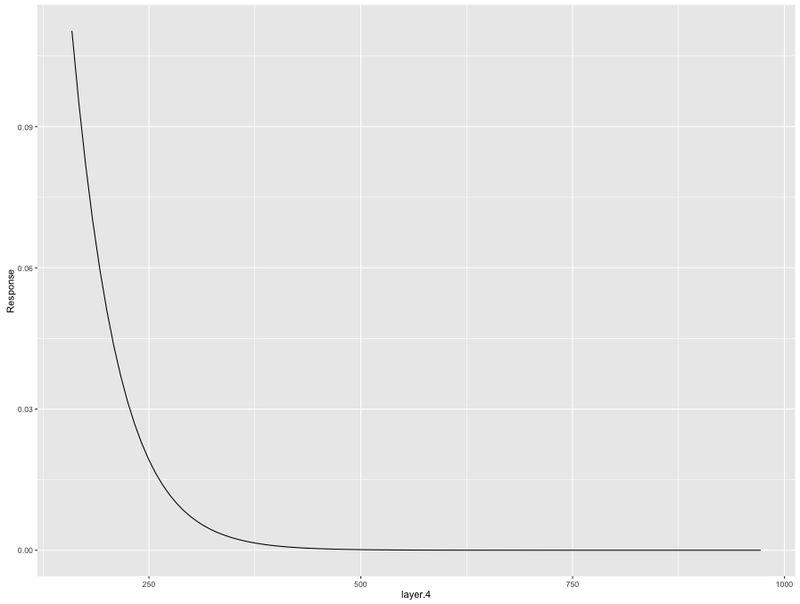 "description"               "reps.overlap"              "p.values"                  "empirical.species.1.model" "empirical.species.2.model"
As with building species models, identity.test works pretty much the same for Domain, Bioclim, and Maxent models with the exception that you don't need to supply a formula. Now that we've got our enmtools.species object and have assigned it presence and background data and a species name, we can use it to build models very simply! For this functionality, ENMTools is basically just acting as a wrapper for dismo, using those functions to actually build models. At present ENMTools only has interfaces for GLM, Maxent, Bioclim, and Domain, but that will change with time. So let's use our enmtools.species object "ahli" to build a quick Bioclim model. I've got a RasterStack object made up of four environmental layers. It's named "env", and the layers are just "layer.1", etc. For Bioclim, Domain, and Maxent, it's that easy! ENMTools extracts the presence and background data from env using the data stored in the species object, builds a model, and returns some lovely formatted output. For GLM we need to supply a formula as well, but other than that it's idential. ## (Intercept) 46.178922  24.777923   1.864   0.0624 . ## layer.2     -0.011985   0.006612  -1.813   0.0699 . 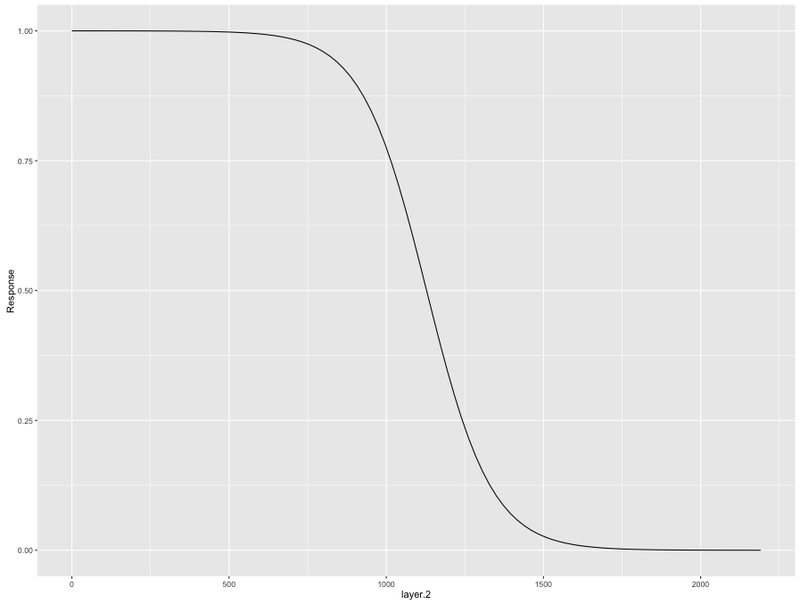 You get pretty, formatted output and a nice plot as well. Next up: identity/equivalency tests! The new R version of ENMTools is in the works! Here's how to build an enmtools.species object. For reasons that will become clear with time (when some of the downstream stuff gets finished), the way you interface with ENMTools is going to be a bit different from how you work with dismo or Biomod. First off, you start by defining enmtools.species objects for each species (or population) that you want to compare. Here I'll create one called ahli (based on data from Anolis ahli). Now that doesn't have any data associated with it, so if we get a summary of it, we basically just hear back from R that we don't have any data. ## Range raster not defined. ## Presence points not defined. ## Background points not defined. ## Species name not defined. Neat, huh? Next up I'll show you how to build an ENM.